Humayun Ahmeder Old Fools Club by Shohid Hosen Khokon is a book of remembering the memory of Humayun Ahmed. Humayun Ahmed was a legendary writer in Bangladesh in Bangla literature. 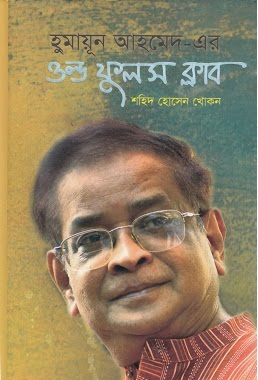 There was a wish of the writer of this book Shodid Hosen Khokon to see Humayun Ahmed from near. The opportunity came one day. He was first to meet to Humayun Ahmed sir in Singapore at Mount Elizabeth Hospital. There was a place to hang out of Humayun Ahmed at Dhanmondi and the name of this place or club is “Old Fool’s Club”. At this club, the writer Shodid Hosen Khokon came regularly and Humayun Ahmed made many fun things to him. The writer of this book said that there is more contribution of Humayun Ahmed in writing this book. This book was dedicated to Humayun Ahmed Sir. So, this book is a really amazing book for you if you love the writings of Humayun Ahmed. You will get much information about Old Fools club of Humayun Ahmed. By the way, If you are interested to read and check out the story of the book named Humayun Ahmeder Old Fool’s Club by Shohid Hosen Khokon, You are greatly needed to click here!